The Samsung Galaxy S8 leaks continue ahead of the full announcement next week. 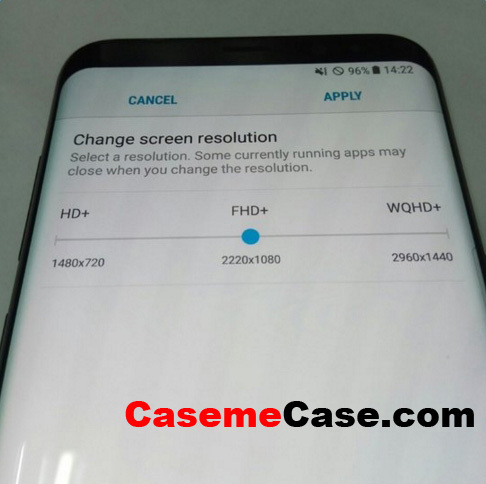 This time there is a photo which suggests that the S8 will have a screen resolution of 2960×1440 and that the phone will employ similar technology to the LG G6 to help cut down on power consumption. It’s worth knowing that it is able to reduce the amount of pixels the phone renders on the GPU. This means that games can be reduced in either resolution or framerate to save power. This is a useful feature to have, although it will compromise the quality of the image somewhat. Still, if you’re on YouTube or playing Pokemon GO it’s unlikely to bother you. Samsung then is forced to drive even more power-hungry phones, and needs clever behind-the-scenes technology to do it. Even so, the rumoured 3000mAh battery in the S8 is lower than LG’s G6, which has 3300mAh and will be a similar size and shape. It’s also been suggested that the battery vendor for the S8 is, in fact, none other than LG, making the smaller capacity potentially more confusing. The larger Galaxy S8+, it is rumoured, will have 3500mAh.